Welcome to another installment of If My Book, the Monkeybicycle feature in which authors shed light on their recently released books by comparing them to weird things. 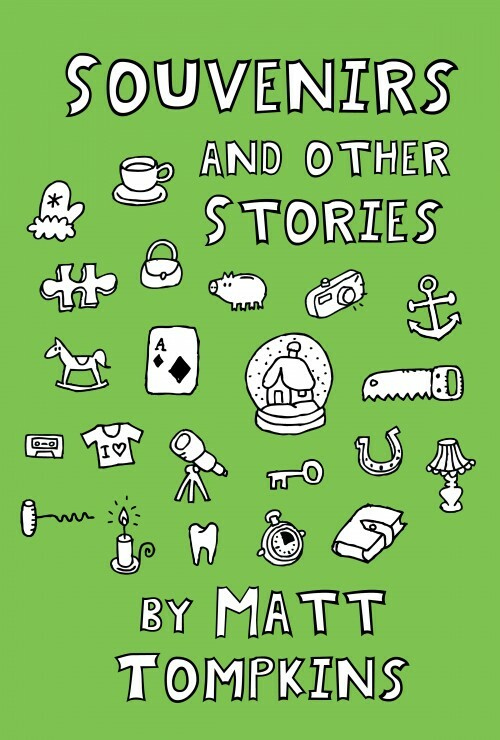 This week Matt Tompkins writes about Souvenirs, his new story collection just published by Conium Press.. If Souvenirs and Other Stories were an oxymoron, it would be the presence of an absence: a seat reserved for an imaginary friend. If Souvenirs and Other Stories were your imaginary friend, you would have tragicomic adventures together without even needing to travel. If Souvenirs and Other Stories were to travel, it would visit Toronto. It would sit at cafes all day, and send you postcards with its small, neat handwriting spilling into the margins. If Souvenirs and Other Stories were jotting marginalia, it would be moderately misquoted lines from Borges and Russell Edson interspersed with doodles of lawn sprinklers and dogs. If Souvenirs and Other Stories were a dog, its bark would sound like an old man’s voice. Its breed would be part spaniel, part shepherd, part dachshund, part coyote, and part cat. If Souvenirs and Other Stories were a cat, it would be a huge, flame-orange, polydactyl housecat—the kind with extra toes. If Souvenirs and Other Stories were an extra toe, its distinctive shape (to say nothing of its color) would make you think of a Cheeto. If Souvenirs and Other Stories were a Cheeto, it would in fact be a dense cluster of six Cheetos fused together, that you pop in your mouth at once, and begin to crunch, just as someone asks you an urgent question. If Souvenirs and Other Stories were a way to pay the bills, it would be a decent desk job you don’t mind, with good benefits, where you fantasize perhaps too frequently about shutting down your computer and shoving your things into a cardboard box. If Souvenirs and Other Stories were a cardboard box, it would be painted sky blue with white cumulus clouds. It would be compact, like a shoebox, but deceptively heavy. If Souvenirs and Other Stories were some other heavy item, it would be an old stereo console. You’re convinced it still works, but you can’t find the cabinet key. If Souvenirs and Other Stories were a key, it would be the one you keep on your key ring, even though you have no clue what it goes to. Sometimes you imagine it would open a climate-controlled storage locker, or a dust-filled garage, or the dank, shadowy cellar of a house you’ve seen in your dreams. You’re nervous about what you’d find there, and you know you could throw the key in the trash and be done with it, but you’re pretty sure you’d feel happier, freer, if you could find whatever the key is keeping captive, and let it out, blinking, into the light of day. Matt Tompkins is the author of two books: Souvenirs and Other Stories (Conium Press) and Studies in Hybrid Morphology (tNY Press). 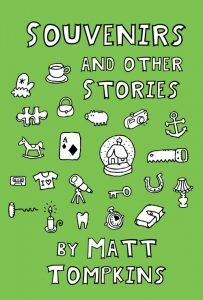 Matt’s stories have appeared in the New Haven Review, Post Road, and online at the Carolina Quarterly, among other places. He works in a library and lives in upstate New York with his wife (who kindly reads his first drafts), his daughter (who prefers picture books) and his cat (who is illiterate).